♡ 100g of Superfood mix, 17 high quality and hand selected superfoods in one optimal blend. Including Matcha, Spirulina, Wheatgrass, Tumeric, Moringa and many more! The superfoods have been ETHICALLY and ORGANICALLY sourced, cultivated and hand-picked from around the globe. We have chosen this combination of super greens, seeds, fruits and roots to bring you the ultimate nutritional mix. See description for more details. ♡ VERSATILE: Add our nutritious superfood mix to juices, smoothies, baking and cooking to benefit from the rich antioxidant, energy boosting and immune supporting pure organic powder. Get creative and detox and cleanse your body! ♡ WHY US? Our products are 100% VEGAN, ORGANIC & NATURAL: Free from gelatin, gluten, lactose, GMO. Unlike other brands, we don’t use additives, fillers, flavouring or bulking agents – clean, natural and pure powder! Certification from the Vegan Society, Pesticide, Organic and Heavy Metal Analysis available on request. 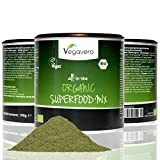 Vegavero ORGANIC SUPERFOOD MIX woman is a purely herbal source of nutrition. Our superfood blend is a combination of 17 different superfoods which have been organically cultivated and handpicked from around the globe. Wheatgrass, Barley Grass, Spirulina, Moringa, Aroniapulver, Chlorella, Peppermint leaf, Pomegranate seeds, Matcha, Orange peel, Lemon peel, Ginger, Turmeric, Beetroot, Spinach, Ceylon cinnamon and Nettle. The combination of superfoods used provides the ultimate nutritional mix: protein, carbohydrates, Vitamins A, C, D, E K, B1, B2, B3, B6, B12, Folic acid, Iron, Zinc, Magnesium, Potassium & Calcium.